Don’t be fooled by the clever wording in your vehicle handbook regarding the replacement of the oil in your transmission. Many manufacturer’s now claim the automatic transmission is sealed for life, meaning the oil never needs to be replaced. Following this strategy will indeed reduce the life of the automatic transmission considerably. Sealed for life really means – sealed for the life of the transmission oil, not the life of the motor vehicle. To enjoy longevity and correct operation of the automatic transmission an oil and filter replacement should be considered around 100,000klm. The modern day vehicle has very advanced computer control systems. 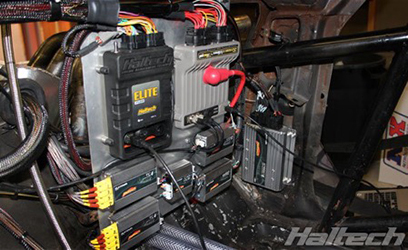 As the transmission in your vehicle has been working away, the computer has been able to perform electronic adjustments to account for wear in the transmission internal workings such as the clutch packs for example. When the oil in the transmission starts to diminish in quality and the clutch material wears the result will be a level of clutch slippage. The transmission computer can sense this by the information it receives from various sensors within the transmission and will apply a higher clamping pressure to the clutch packs until this slippage is overcome. This is why the transmission never feels any different in the way it operates. That is until the critical point when all the clamping pressure available can no longer overcome the wear and tear in the transmission– end of life. 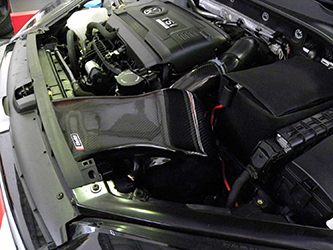 When a transmission service has been undertaken a process known as a clutch adaptions should be performed to reset the transmission control unit. Special diagnostic equipment is required to perform these adaptions, equipment which Andrews High Tech Automotive have invested in to ensure your transmission will perform faultlessly. With periodic servicing we trust your transmission will perform for a long, long time without the confrontation of expensive repairs. 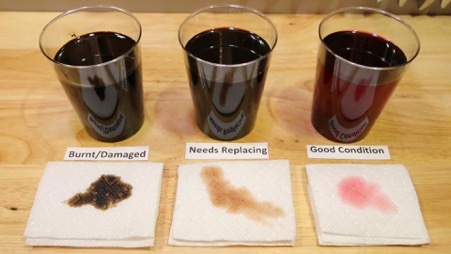 Above are samples of transmission oil – from right to left The Good, The Bad and The Ugly.